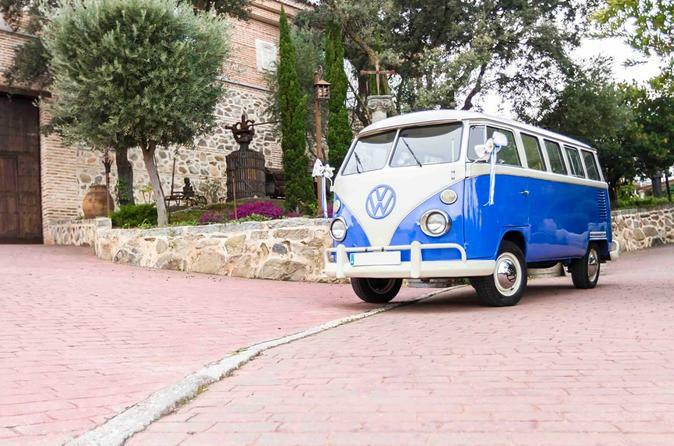 Enjoy the top attractions in Madrid on this 2 hours panoramic tour of the city by a vintage restored Volkswagen Bus T1 from 1973. Stop by well-known Madrid landmarks such as the city's Alcalá Gate, Cibele's Fountain, the Almudena´s Cathedral and the Royal Palace. Along the way you'll tour historic plazas like Plaza de la Villa, and old street markets. See the important neighborhoods and view the city's grand boulevards, listening the stories and details of their history and significance. This tour offers both am and pm departure times plus a complimentary bottle of wine for you to enjoy after the tour. Departures: morning, afternoon and evening. Tour takes 2 hours depending on traffic conditions. Main attractions you can choose to see: Mayor St., San Miguel market, Almudena Cathedral, Royal Palace, Cibeles Sq., Castellana Av., Colon Sq., Real Madrid Stadium, Castilla Sq., Serrano st., Alcala gate, Retiro Park among others.